A festive Sour Cream Cake topped with silky whipped cream cheese frosting. Fresh strawberries and blueberries make this beautiful low carb dessert a standout! July 4th is always a fun day – a time for cooking out on the grill and sharing food and fun times with friends and family. Watching the firework display with my kids, in the neighborhood park, is the climax of the evening. But, being the baker that I am… I love to wow my guests with dessert! Part of the Independence Day fun is making delicious red, white and blue desserts to wow friends. 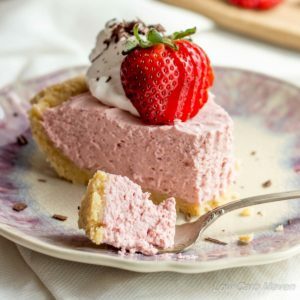 Traditional desserts like Blueberry Crumble Bars, Strawberry Shortcake, or Strawberry Cream Pie are always a hit. 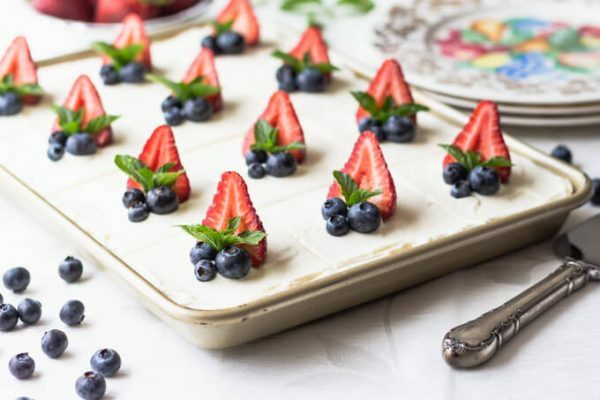 Independence Day desserts, festively decorated with strawberries and blueberries, are popular this time of year. Berries provide the perfect “pop” of traditional red, white, and blue color. Boy do I have an amazing cake for you! 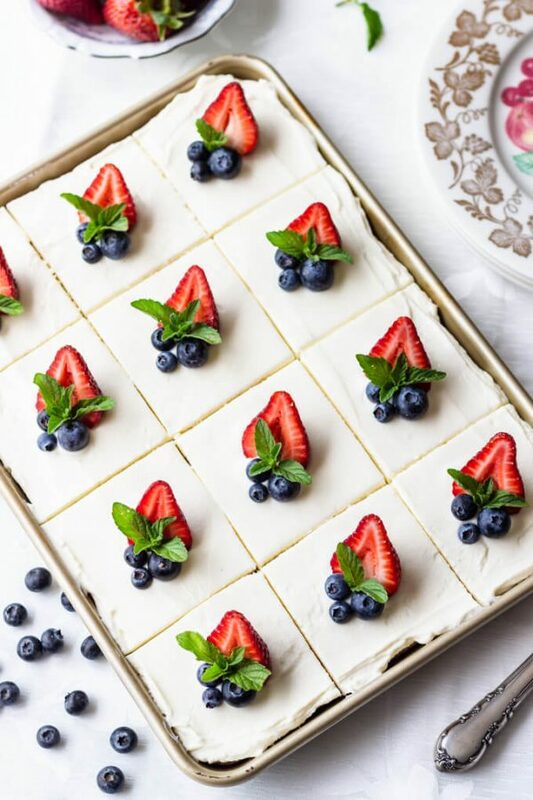 An incredibly moist sheet cake topped with whipped cream cheese frosting and decorated with fresh berries. This Sour Cream Cake is perfect for July 4th and all summer. 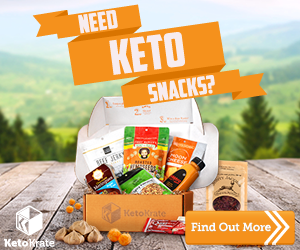 We low carb Keto dieters keep our fruit consumption to a minimum in order to keep blood sugars low. The judicious use of fresh berries as a garnish allows us to enjoy without out over-doing it. And, it looks so pretty. I originally tested the cake with buttermilk, but switched to sour cream to lower the carbs. The sour cream imparts a subtle flavor and lush texture. Using all almond flour keeps the recipe simple. This sugar-free whipped cream frosting is my husbands favorite. You’ll find a hint of butter in the in the background and just enough vanilla to balance the tartness of the cream cheese. Starting with cold cream cheese ensures that the heavy cream will whip, producing a more stable frosting. Erythritol based sweeteners can sometimes recrystallize after sitting in the refrigerator – especially in moist confections. We’ve all experienced “crunchy” frostings or cake fillings. To reduce this effect, I use a finely powdered sweetener like Sukrin Icing Sugar (Melis). To get the best results in your frosting recipes, make sure to beat the icing sugar with butter or cream cheese for several minutes to encourage it to dissolve. When completely dissolved, less/finer crystals form. 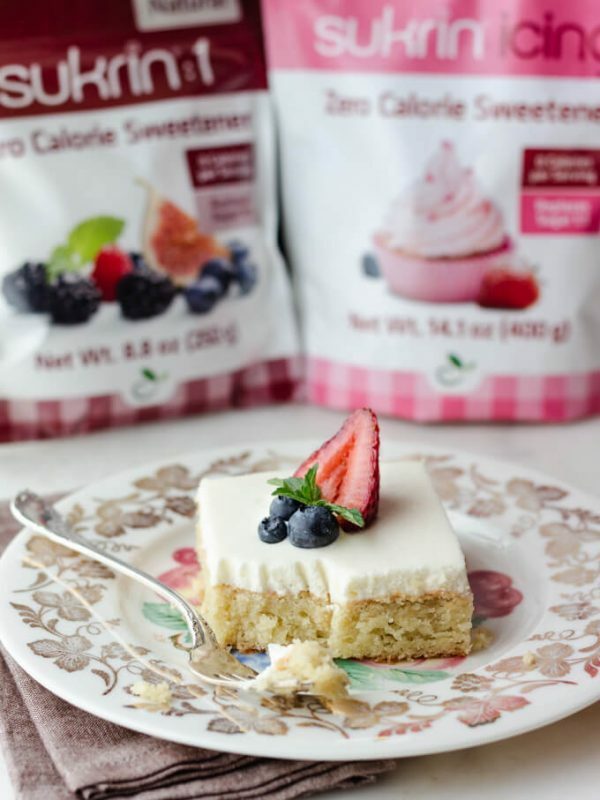 Another trick is to use less erythritol and augment sweetness with stevia. Make sure to read the notes in the recipe to see how I make my cakes at home. I never do it all in one day anymore. Making a dessert in stages reduces stress and produces better results. 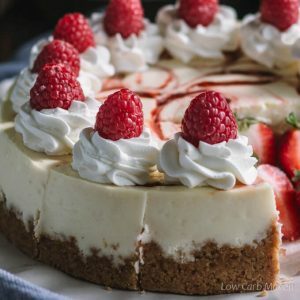 Each Serving of this pretty Sour Cream Cake is 4.5 net carbs. 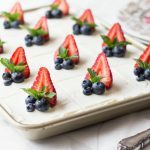 An incredibly moist low carb sheet cake topped with whipped cream cheese frosting and decorated with fresh berries. 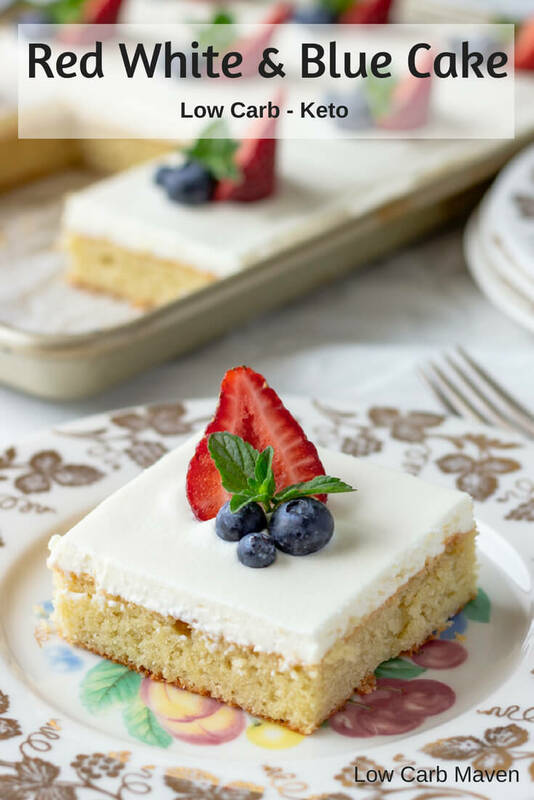 This Sour Cream Cake is perfect for July 4th and all summer. Preheat oven to 350 degrees F and place rack in middle position. Spray a 1/4 sheet pan (small jelly roll pan) with baking spray. Line the bottom with parchment paper and spray the paper. Stir almond flour before measuring with a whisk to break up any lumps. Measure all of the dry ingredients into a medium-large bowl. Whisk to thoroughly combine. Add all of the wet ingredients to the dry ingredients and mix thoroughly with a hand mixer. Scrape the thick batter into the prepared sheet pan and smooth evenly with an offset spatula for best results. Place the cold cream cheese in a small-medium bowl with the powdered sweetener, vanilla extract and stevia glycerite. 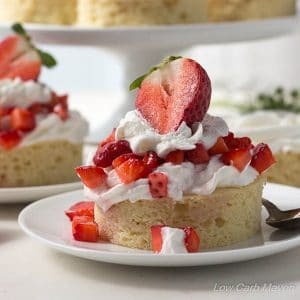 Beat with a hand mixer until the cream cheese is completely smooth and fluffy, about 1-2 minutes, scraping down the sides to incorporate any stray lumps. Add the soft butter and repeat. Incorporate the heavy cream, 1/4 cup at a time, whipping well between additions. Beat the frosting until it resembles whipped cream and the sweetener has dissolved. Frost the cake. Garnish with fruit. Cut and Serve. 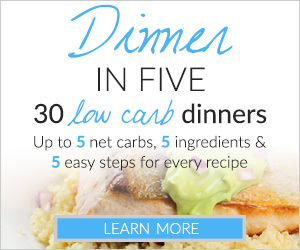 Serves 12 at 4.5 net carbs each (including the fruit). I baked this cake two days before photographing. I frosted it the night before and left it in the fridge uncovered. Then, I carefully measured and cut my pieces. Lastly, I decorated it just before photographing. The strawberries were medium sized and the blueberries were very small. The biggest blueberries were medium sized with the others the size of small peas. I used mint from my garden, but you could use a larger single leaf of mint or very small triangles of lemon, too. Always let a low carb cake sit on the counter for 10-20 minutes before enjoying. The fat solidifies in the fridge causing a firm texture which some mistake as being dry. I take my dessert out at dinner time and it is ready by the time we are finished. This cake keeps well in the fridge for a week and can be frozen. I baked this cake for a graduation ceremony and it was a huge hit!! A few people asked me for the recipe so I gave them the URL of this page. Thank you for sharing your special recipe!!! This looks perfect for the 4th of July. 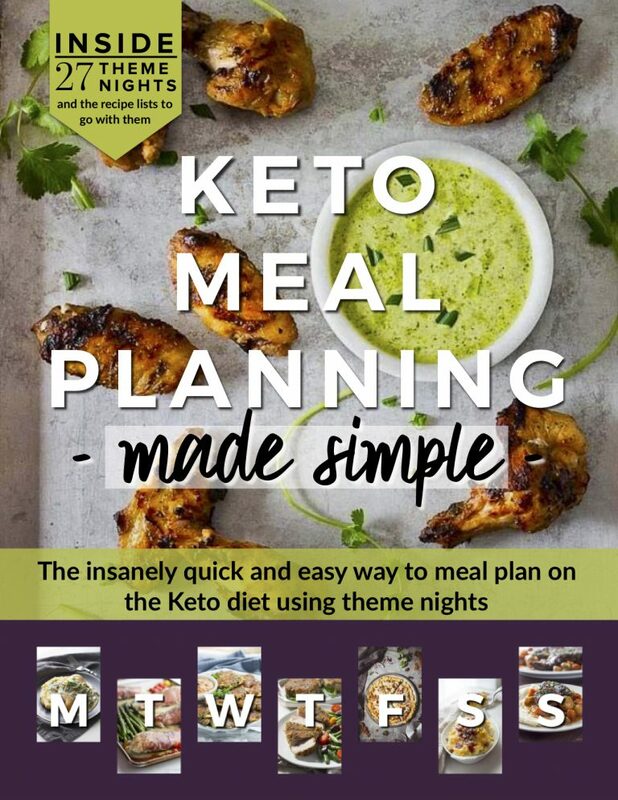 I’m the only Keto/low carber in my family and I think a 9 x 13 would just be too big for me- or I’d eat too much! Can I half the recipe and make it in an 8 x 8 pan? Think that will work? I can’t wait, I will make this lovely cake perfect for the 4 of July, Thank you. What is Stevia Glycerite? Is it just regular Stevia? Kim, what a gorgeous dessert this is !!!! Love the fruit decoration on the top….so inviting. This sounds delicious. Sour cream, yum. Would be so nice for a bridal shower as well…one of the prettiest low carb cakes I have ever seen, and so easy. Can’t wait to try it. If I did the math right, this cake had about 100 grams of carbohydrates, is that right? 60 grams from the almond flour and 30ish hands from the cream cheese. This is beautiful! Perfect for Independence Day. I am so excited to try this! 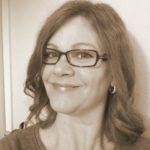 Are swerve and Sukrin the same?